If I could kiss a recipe because it is so good this would definitely be one of them. For real. I just made the first batch and taste-tested one and it was so delicious and crispy. 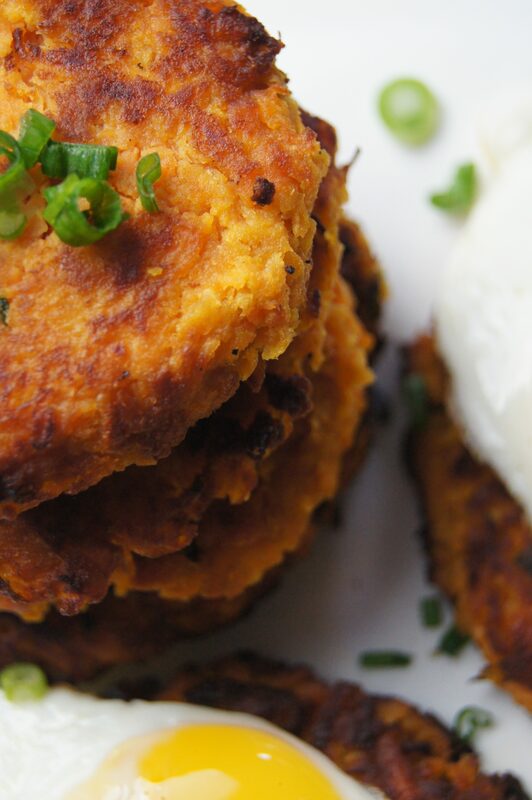 I don’t quite believe in love at first sight, but these Sweet Potato Hash Browns are making me believe that maybe it does exist. Or maybe at least there’s a version of it that applies to taste. Bruno Mars’ new song, “24K Magic” was playing when I took my first bite, which makes it all the more of a happy occasion. I was so excited that these Sweet Potato Hash Browns turned out so well I think I may have actually done a little dance. OK, I stepped back and then stepped forward. In my talentless dance world that’s considered dancing. 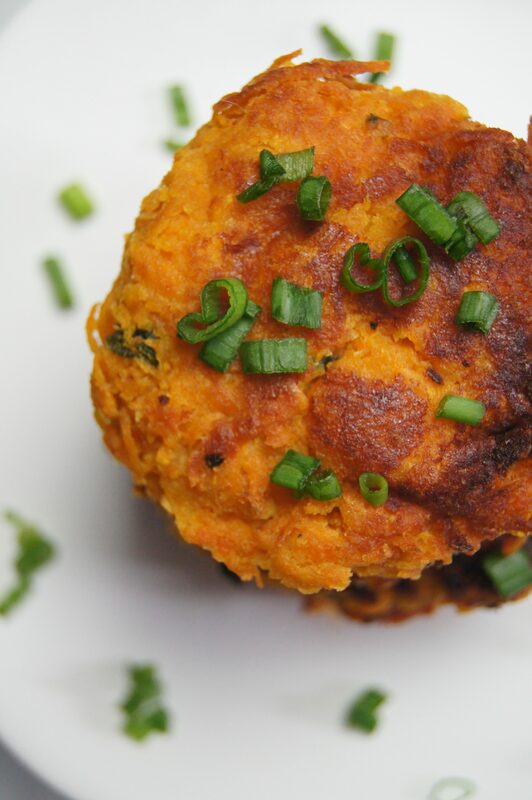 This recipe is easy to put together, especially if you have a food processor with a blade for grating the sweet potatoes. I have one, but it was in the back of my pantry and I didn’t feel like taking a whole bunch of stuff in front of it out to get to it and then have to clean it up later. I thought that grating the sweet potatoes by hand with my box grater was a much better option. Until my arm started to cramp up. I passed the time grating the sweet potatoes by continuing to listen to my playlist. Adele’s “All I Ask” came on and I sang along like I was singing the final song of my farewell tour. I killed it. And I think I may have killed a vocal chord too. Something definitely popped. The original recipe calls for almond flour and usually I would use Trader Joe’s almond meal. I know, there’s a difference. But almond meal is what Trader Joe’s sells and therefore what I always have on hand. But during my last visit to Trader Joe’s I was pleasantly surprised to find that they’re now selling almond flour. I was so happy I almost went back to the wine and cheese sample table for seconds. I decided to give it a try – the almond flour that is, not the wine (again). I’m glad I did. I think the almond flour kept the grated sweet potato together better. And I’m going to give Trader Joe’s almond flour a try the next time I make my Paleo Bacon Chocolate Chip Cookies (http://www.thetastypage.com/bacon-chocolate-chip-cookies/) . 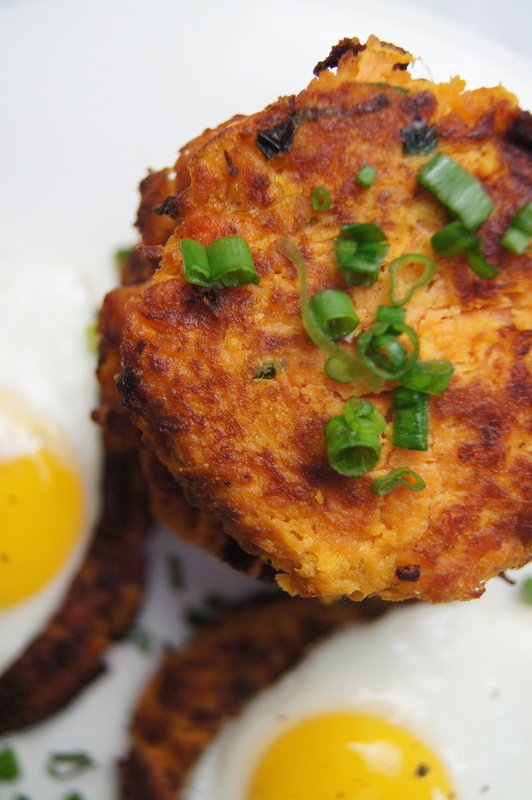 I love that these Sweet Potato Hash Browns are so versatile. You can have them as an appetizer, either alone or maybe with some guacamole. 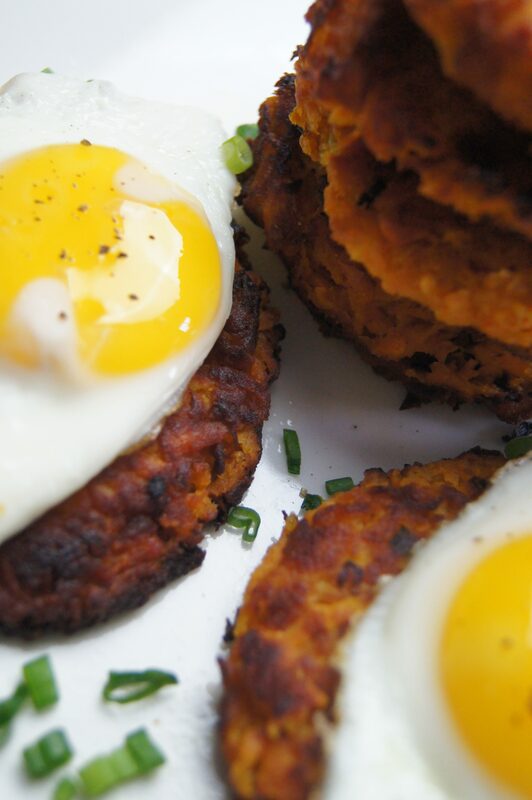 Or you can top it with a fried egg and have it for breakfast – or breakfast for dinner. Either way, anything with an egg on top is heaven in my book. 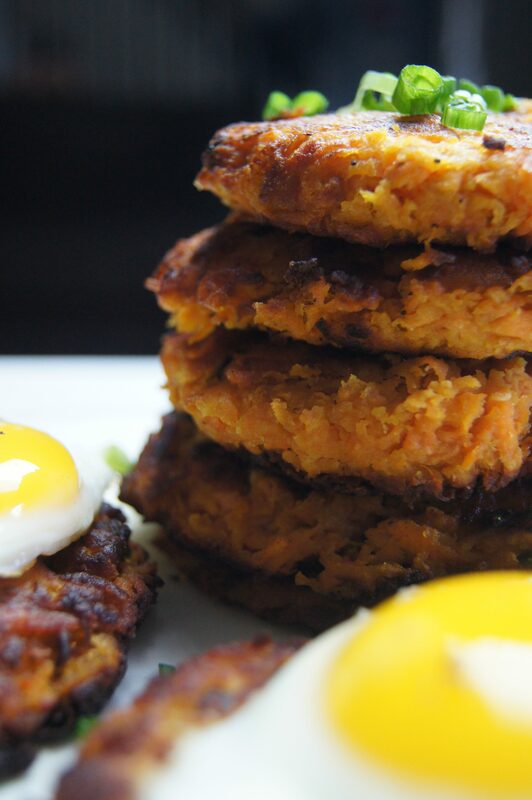 I will definitely make these Sweet Potato Hash Browns again. And when I do, I’m going to cook up some bacon, crumble them, and add them to the mix. Seriously drooling just thinking about that. Take the other 3 sweet potatoes and peel them. Then grate them on a box grater using the large holes, or use a food processor fitted with a large-holed grater. Place the grated sweet potatoes in a large bowl. Add the previous mashed potato, the 2 whisked eggs, almond flour, sea salt, and green onion. Using your hands or a spoon, combine all ingredients until they are fully incorporated (I found that using my hands worked best). In a skillet or cast iron pan, pour coconut oil and heat over medium until your pan is hot. If you have a thermometer, it should read 350 degrees. 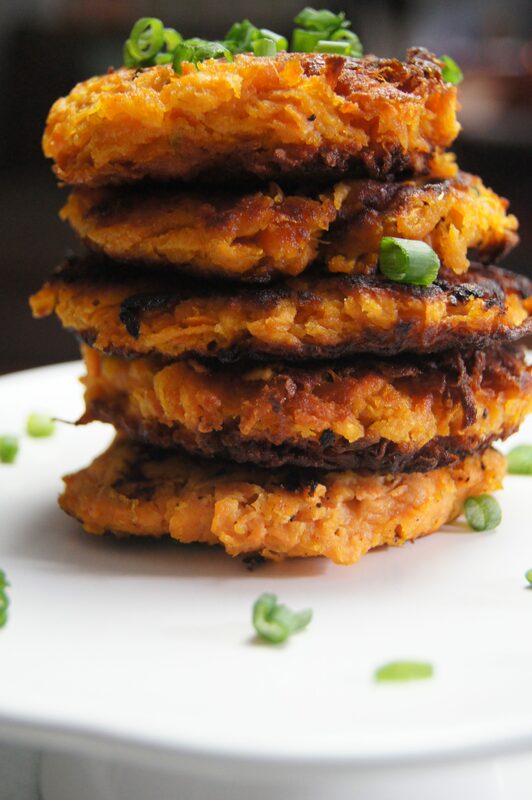 Take 1-2 heaping tablespoons of sweet potato and form them into patties and place them in the pan. Cook on each side for about 2-3 minutes, depending on the thickness, and until golden brown. Add more oil to the pan if needed for the remaining batches. Once cooked, place on a plate with paper towels to drain the oil. Once drained, place on a serving plate and garnish with scallions.